Electric grills are becoming more and more popular. This is because, unlike charcoal or gas grills, they offer more compact options suitable for indoor grilling and are a lot easier to clean. From sandwiches to porterhouse steak there is nothing an electric grill can’t cook. With so many options out there, choosing the right one can be tricky. To help you find the best one for you, without any hassle at all, we have put together this electric grill buying guide. Panini Electric Grills: If you are looking for a professionally pressed grilled cheese, then a panini grill is just what you need. With the added benefit of being able to grill meat as well as a variety of sandwiches, they are a compact grill choice for smaller kitchens. 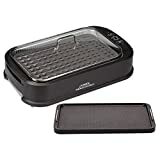 Clamshell/Contact Grill Electric Grills: These grills are designed to allow for fat-free cooking as most models include drip trays and slanted surfaces to help get rid of oil during the cooking process. Made famous by the Foreman Grill brand contact grills cook vegetables and meat evenly and quickly. If you are looking to grill up burgers for up to 8 people, or prefer low-fat cooking, then this is the grill for you. Tabletop/Open Grill Electric Grills: Tabletop grills are larger grills designed to be used on tables. Bigger than clamshell grills they come in different sizes and styles and make traditional barbecuing possible anywhere. 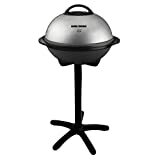 Indoor/Outdoor Electric Grills: These grills are domed-shaped mimicking the design of standing charcoal grills. Large enough for big cook outs, indoor/outdoor electric grills offer the simplicity of electric grilling without compromising on size. 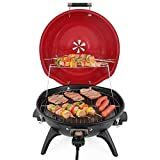 Interchangeable Grill-Plate Electric Grills: Similar to contact grills, these electric grills have interchangeable grill plates so that users are able to change the cooking surface to suit the type of item they are grilling. From griddling to waffles, these grills are a great combination griller. Operation: Electric grills that are easy to operate with simple controls, are rated much higher by their owners. 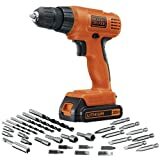 Choosing a reputable brand with good ratings will go along way to ensuring you get the same out of your purchase. Power: Reviewers who bought powerful electric grills rate their grills much better. In general grills of 1500 (and higher) watts are the best reviewed with owners stating they are efficient, using less power than an oven grilling perfectly. 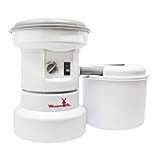 Build: Models that are compact and easily stored while still being able to grill a large steak, are the top of the electric grill food chain and get the highest reviews. Overall, people who chose a type best suited for their storage restrictions and cooking preference were much more satisfied with their purchases. Features: Alert tones for when cooking time is over, removable grates, soft touch controls, timers, and adjustable heat settings are among the features reviewed most for adding value to their electric grill purchases. The first thing to consider when choosing your grill is how much versatility you need and the types of food you plan to grill. For sandwiches, panini grills are efficient. If you looking to grill steaks for a larger family, tabletop or outdoor electric grills may be better suited. For the easiest cleaning look for an electric grill with nonstick surfacing and dishwasher safe parts. The power of an electric grill is measured in watts. To ensure your food is efficiently grilled and browned to perfection, choose a grill that offers power of 1000 watts or higher. How much grill space do you have? Deciding on the type of grill is often determined by the amount of space you have and where you will be grilling. For quick kitchen grilling in smaller homes, clamshell grills are well suited and can be easily stored away. For bigger homes where space is not an issue, table top or dome-shaped grills can handle a larger feasts. When choosing an electric grill consider the width of the ridges- the wider the ridges and the closer they are together the larger the cooking surface will be. Contact grills come in three sizes: small for grilling food for two people, medium that can cook for up to 4 people and large 8 people sized grills. When choosing a closed grill, consider a model with a floating hinge to ensure that even the thickest cut of meat is cooked perfectly. 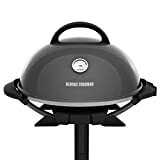 Electric grill features worth investing in include adjustable temperatures for more cooking variety, locking hatches for added safety with little fingers around, a non stick drip pan for healthier cooking and easier cleaning. T-fal: Since inventing the non stick surface in 1954, the T-Fal brand has become a leading non stick cookware and appliance manufacturer. Char-Broil: Specializing in electric and charcoal grills, Char-broil is a top rated brand known for their quality craftsmanship. 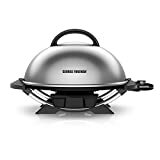 George Foreman: Invented in 1994 and manufactured by Spectrum brand, George Foreman grills were the first electric grills aimed at making meat cooking leaner. Weber: Weber has been a household grill manufacturer for over fifty years and are known for their quality products.